Throw away those flying bus cables. Upgrade your uZeus, Row Power, Deluxe Power, Super Power or similar 4 hp power module with 16 pin Euro Header outputs. EHA is a kit with two small adapter boards plus heavy 14 AWG wire that lets you attach 16 pin Euro Power headers to the Genus Modu Low Impedance Bus Board (LIBB) or other bus boards. With EHA + LIBB you'll reduce both switching power supply noise and inter-module coupling noise in your system, while retaining the investment in your 4 hp power supply. You can use the Paypal button below to order one or more EHAs directly from us. Make sure to choose the correct delivery option. The specified price is the final one including shipping. 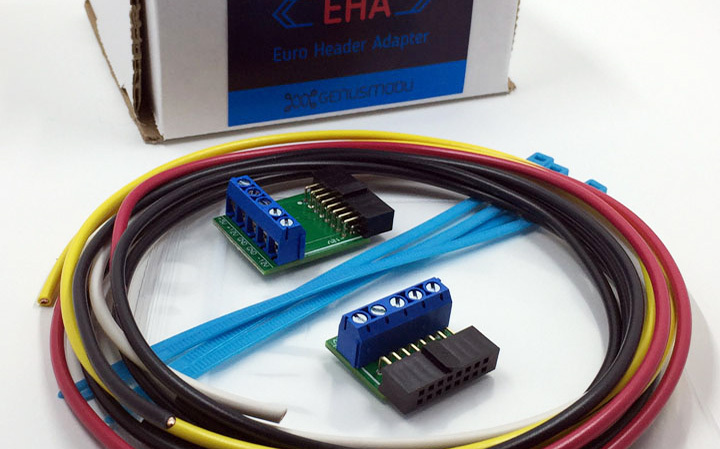 The Euro Header Adapter provides a lower resistance connection from the 4hp module 16 pin euro heads to your bus board solution. When used with a Genus Modu LIBB, the typical end to end +12V or -12V resistance is 7 milliohms or less and ground resistance is 5 milliohms or less. Compare this to a 15 inch flying bus cable with 40 milliohms of power rail resistance and 13.5 milliohms of ground resistance. The higher resistances of flying bus cables increase noise coupling between modules. 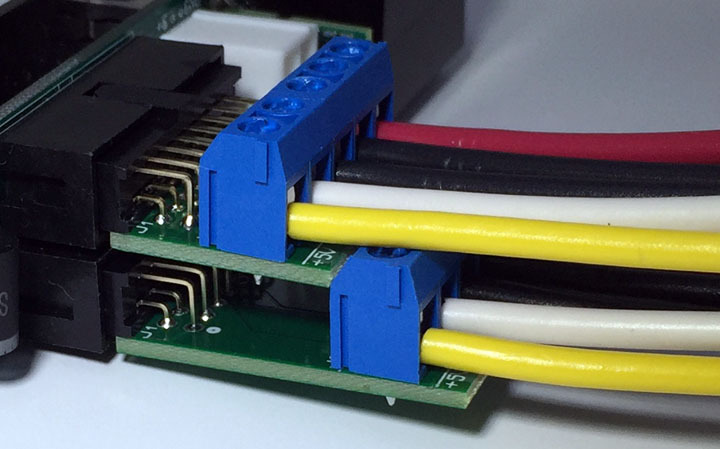 The cables also do not provide any filtering for the switching power supplies. 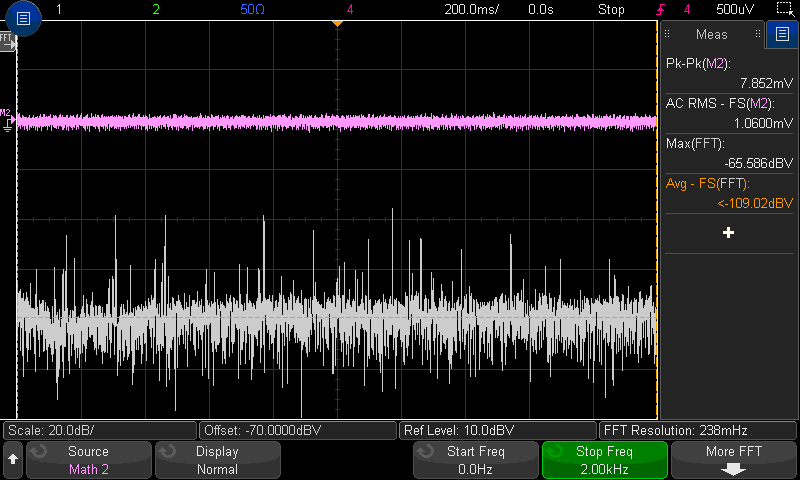 Only 7 modules were run in this test as the oscilloscope requires two slots for 50 ohm and 1 Mohm 1:1 probes for the measurements. The flying bus cable is 15 inches long with 9 euroheader connectors, while the EHA+LIBB measurements use an EHA board, 12 inches of 14 AWG cable, and a Genus Modu LIBB for the power distribution. Locations of the module and test point power connections were kept as similar as possible across the two different topologies. 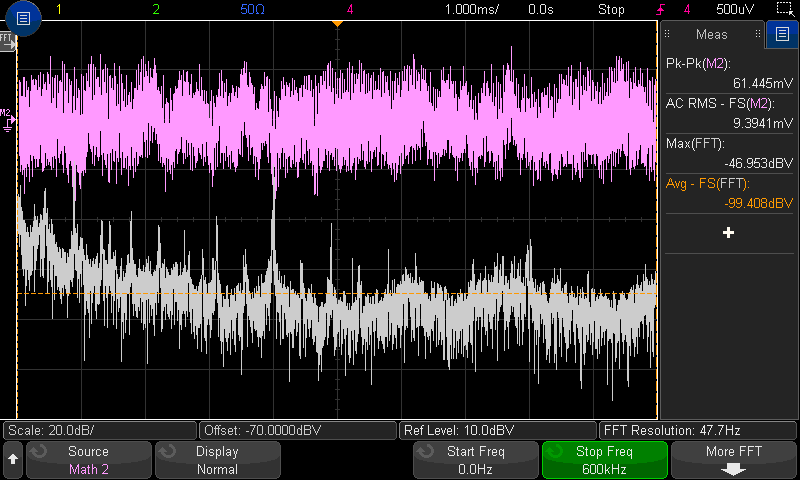 In the images that follow, the top pink shape is the power bus noise waveform with amplitude for the vertical axis and time for the horizontal axis. The bottom white shape is the power bus FFT spectrum, shown in a logarithmic scale for the vertical axis and a linear frequency scale for the horizontal axis. 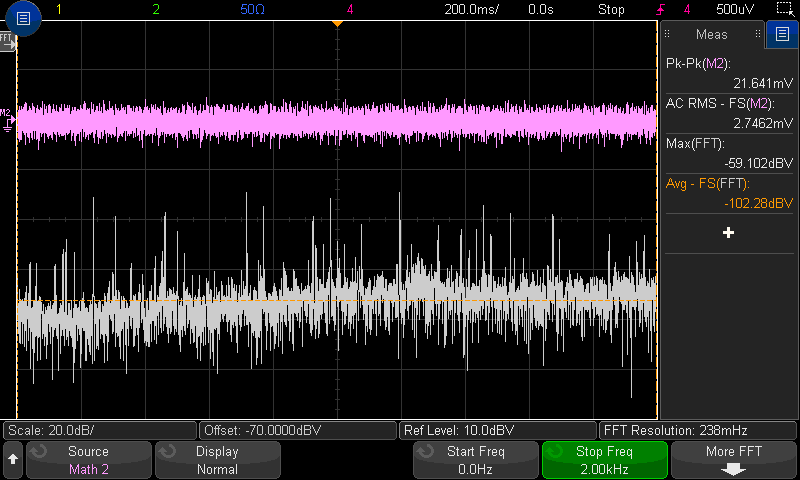 The EHA plus wire plus LIBB combination shows an average 3 times reduction in peak to peak and root-mean-square (rms) noise voltages across the audio and video spectrum. The noise spectrum reduction ranges from -7 to -12 dB on average. 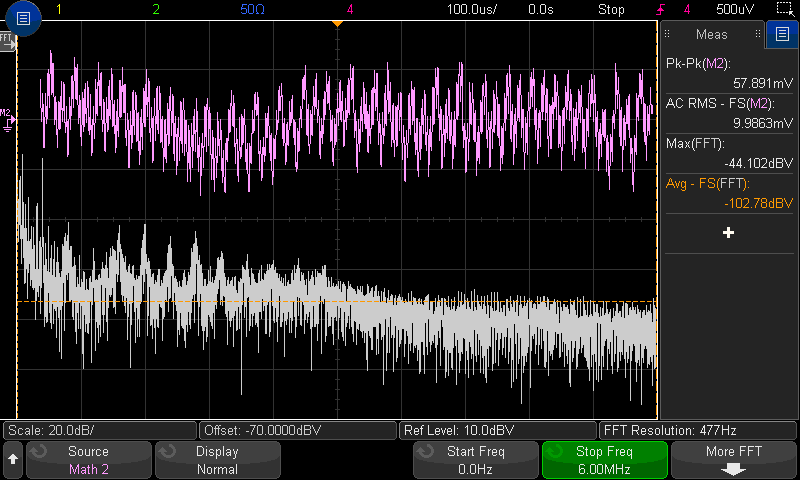 Most of the high frequency reduction over 4 KHz comes from LIBB’s effective capacitance and ultra low impedance across the frequency spectrum all the way to 6 MHz. 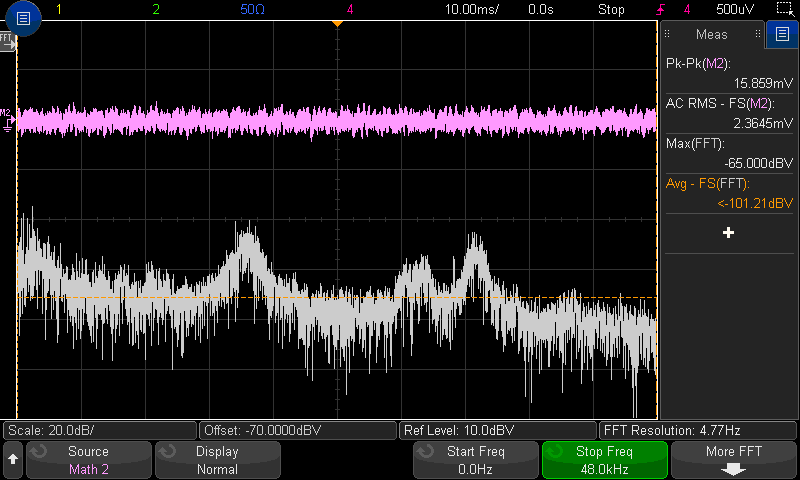 Other bus boards will show much reduced benefit over 4 KHz and some reduction in benefit below 4 KHz due to their higher impedance. The next images show the spectrum results in Wavelab after capture from a MOTU 16A Audio Interface, using a quiet output mixer with no inputs and pots at zero plus an Intellijel IO module for balanced outputs. 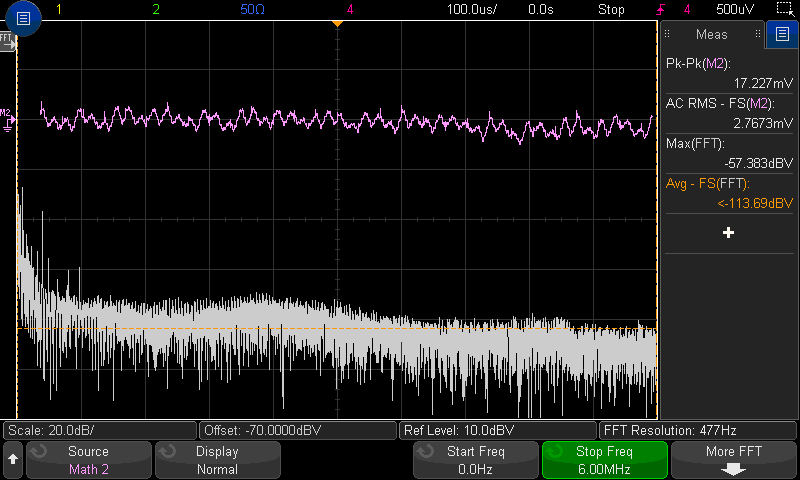 The frequency range goes to 48 KHz and the frequency scale is logarithmic. In this case the switching power source has significant ripple from the AC power line, at frequencies 60, 180 and 300 Hertz, when using the flying bus cables. 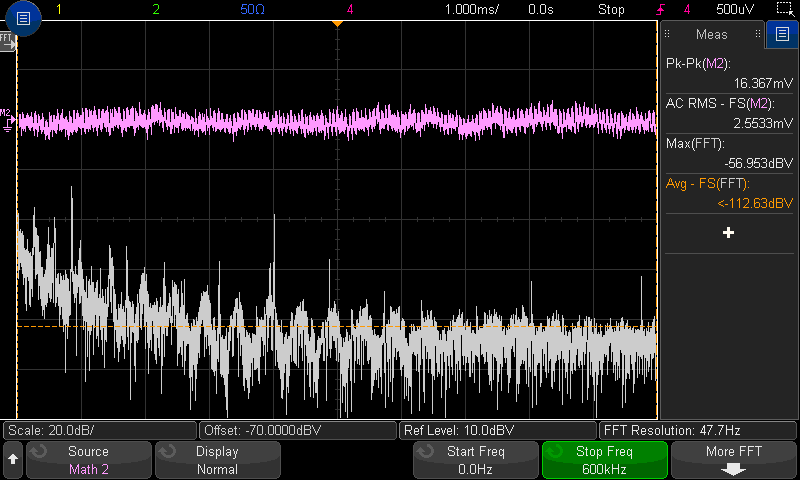 The effective capacitance on LIBB is sufficient to reduce those harmonics by 20 to 30 dB. 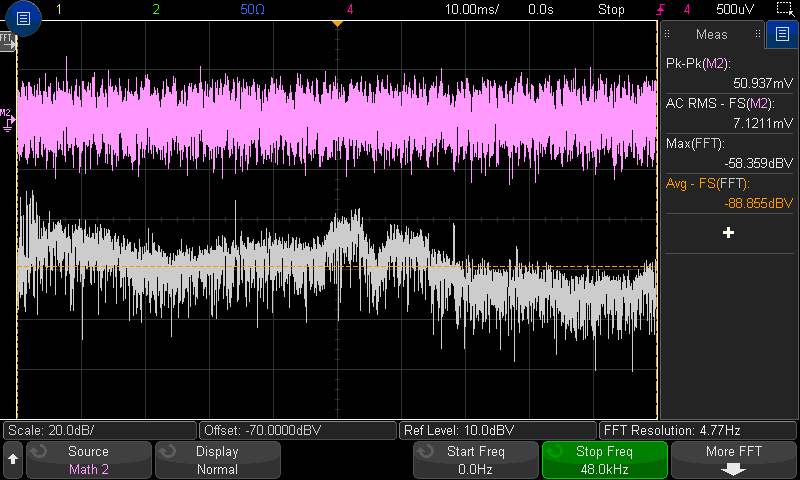 All other noise components in the audio frequency range are also substantially reduced with EHA+LIBB. One EHA-S, one EHA-L and 30 inches of 5 color coded conductors are provided with each EHA kit. For a 4 hp wide power module, an additional 1 hp of space may be required on one side for overhang of the terminal strips, depending on clearance to your cabinet side or to the adjacent module.